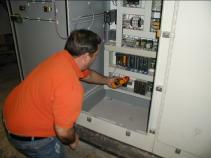 Our staff has over 30 years of combined experience repairing, replacing, and upgrading electrical controls. Our staff has been involved with programming and troubleshooting of all major PLC brands. Our staff has expertise in AC, DC and servo controlled systems. Our unique skills provide our clients with the solutions needed to improve production and run-time rates. Let Compass Automation, Inc. provide you with the top-tier engineering services that your competitive market demands.